Well, a winner has been chosen in the Betty Crocker Gluten Free Giveaway! After a painstaking process (read: submitting a comment to my blog), the lucky winner will receive a Betty Crocker prize pack with all 4 gluten free mixes, a reusable grocery bag, a pad and paper, and coupons for two more free mixes! Wait wait wait, first I have to tell you HOW I chose the winner! First, I wrote out the names of all of the people who entered the contest. Then, I cut all of the names so they would unattached to the other entrants' names. Unfortunately my earnings from Gluten Freeways don't allow me to expense that yet. As I was saying, I folded all the names up and put them in the official selection bowl. Picked out April M! So April, congratulations. 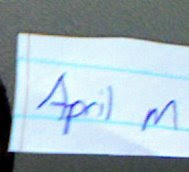 Unfortunately, I don't have April M's contact information. April, if you're reading this, send me an e-mail!